BEIRUT (AP) — Turkish President Recep Tayyip Erdogan said Sunday his country may take further action against Kurdish militants in Iraq and Syria, as U.S.-backed forces in Syria closed in on the last neighborhoods of a former stronghold of the Islamic State group. The U.S. views the Kurdish-led Syrian Democratic Forces as the most effective partner to counter the Islamic State group in northern Syria, an assessment bolstered by the SDF's steady advances against the jihadists. But it has complicated relations with Turkey, which views the group's Kurdish component as an extension of a terror group operating inside its own borders. In Istanbul, Erdogan insisted that U.S. support for such groups "must come to an end," and said he would bring up the matter at a meeting with President Donald Trump next month. Tabqa is 40 kilometers (25 miles) southeast of the Islamic State group's de facto capital Raqqa and an important stronghold for the militants. It lies next to the Tabqa Dam, one of several controlling the flow of the Euphrates River. The Britain-based Syrian Observatory for Human Rights monitoring group said the SDF's control of Tabqa was "practically total." Turkey, however, has remained hostile to the Kurdish People's Protection Units, known by their Kurdish acronym the YPG, which form the backbone of the SDF. The YPG are close to the Kurdish PKK insurgent group in Turkey, which is designated as a terror organization by NATO and the U.S.
U.S. troops were seen Saturday in armored vehicles in Syria in Kurdish areas in a show of force apparently intended to dissuade Turkey and Syrian Kurdish forces from attacking one another. Kurdish officials describe the U.S. troop movement as "buffer" between them and Turkey. The YPG is distrusted by Turkish-backed anti-government forces in Syria, who say the group is an ally of President Bashar Assad's government. The YPG and Syrian government forces have largely avoided confrontation over the course of the country's six-year-long civil war. Other Kurdish parties accuse the YPG's political arm, the PYD, of squelching dissent and embracing authoritarianism. 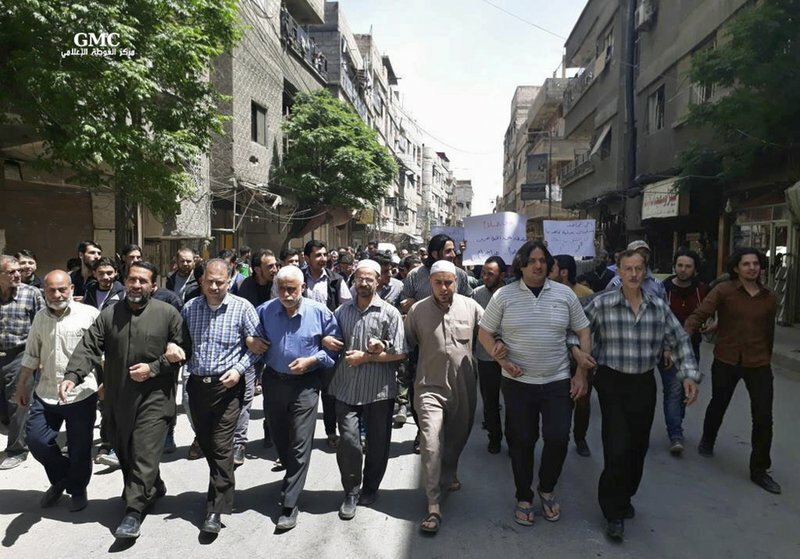 In other developments, more than a thousand residents of Damascus suburbs demonstrated against anti-government rebel infighting, activists said, only to be met at one demonstration by rebels who tried to disperse the protest with gunfire. Videos from the Arbin suburb showed demonstrators scrambling for cover after gunmen dressed in military fatigues lined up in front of the march and fired, largely into the air. Seven protesters were wounded, according to the activist-run Ghouta Media Center, which posted the video. The Observatory said 12 people were wounded. Demonstrators blamed the powerful Army of Islam group for trying to suppress the march. 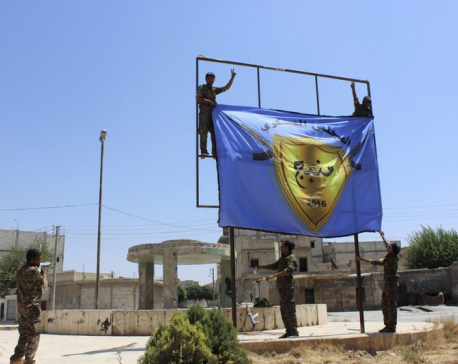 The infighting pits the Army of Islam against the al-Rahman Corps and al-Qaida-linked group the Levant Liberation Committee, or Hayat Tahrir al-Sham. Each side blames the other for triggering the fighting in the power struggle over control of eastern Ghouta. The area, which includes Arbin, has been held under siege by government forces for more than three years. Residents depend on smuggling and local farming for food. "My friend, the mujahid. You are responsible for our struggle. You are not a mercenary. Do not point your gun at your people," one of the signs held by demonstrators announced. "The struggle is the path to heaven. Beware of the path to hell." In 48 hours of fighting, the Observatory said at least 87 insurgents from the warring sides were killed. 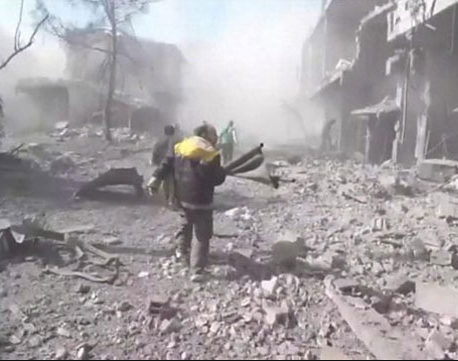 Eight civilians were also killed in the fighting.